I had few over ripen banana in hand. First I thought of making banana appam for Aadi friday Neivedyam. 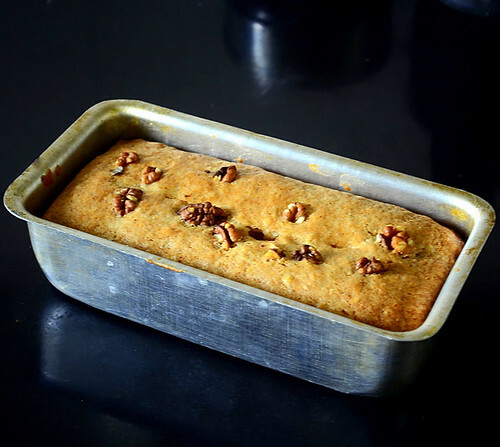 But then I changed my mind to make an eggless, butter less, moist banana bread recipe with yogurt. 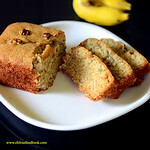 I have already shared eggless banana walnut muffin and eggless vegan banana cake recipes. But still when I came across this cake recipe with yogurt and cooking oil, I got tempted to give a try. The result was a perfect, moist banana bread.The aroma of the bread while it bakes was awesome and we were badly waiting to taste it soon after baking . As I expected, it was a very big hit with Sendhil and Raksha . I am so happy to share an easy, interesting, bread recipe with banana. You can replace maida with wheat flour, plain sugar with brown sugar and use walnut for healthy options. 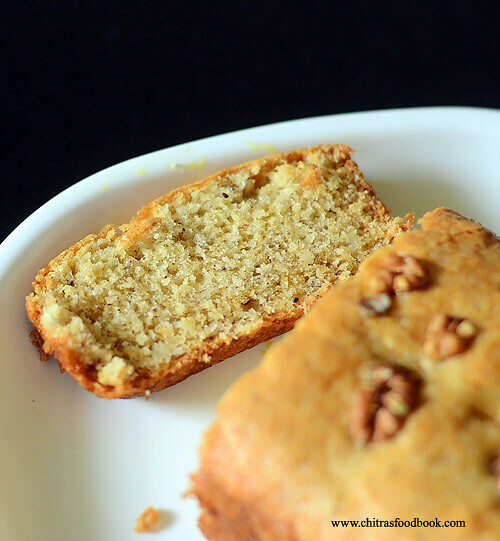 Do try this cake in this weekend and enjoy your teatime with this bread recipe! I have shared a quick, short video too. 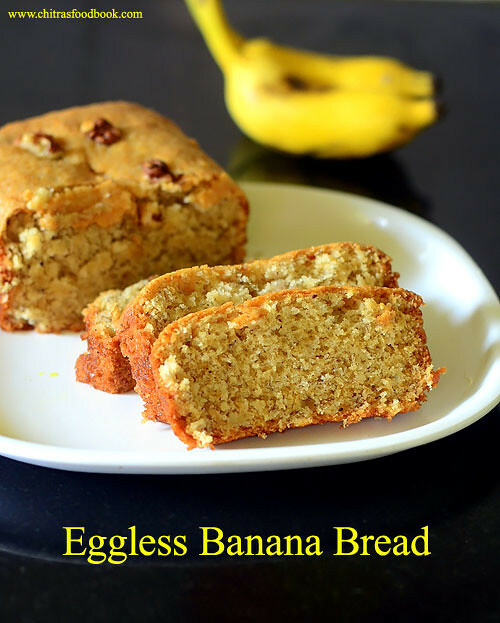 Check it out..Ok, Lets see how to make eggless, butterless banana bread recipe with yogurt. 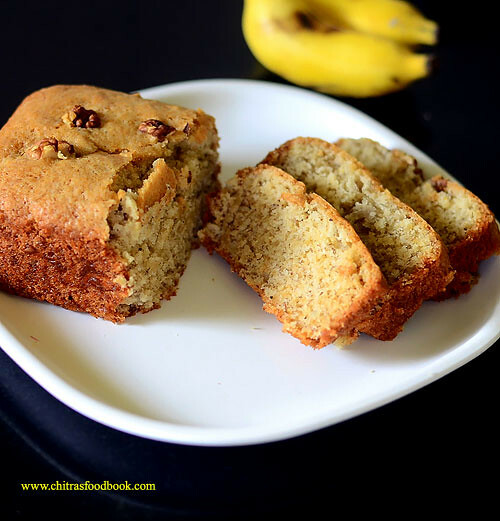 Eggless, butter less banana bread recipe with yogurt and cooking oil ! In a wide bowl, mix the dry ingredients – Maida, baking powder, baking soda, a small pinch of salt. You can either sieve them or just mix with a ladle well. Take the banana, peel the skin and mash it well using your hands or back of spoon.Set aside. In another bowl, mix the wet ingredients i.e. Cooking oil, yogurt, vanilla essence, mashed banana and mix well. To this mixture, add the maida mix. Use a ladle and mix well thoroughly. The batter would be very thick, sticky and looks like a thick paste. Grease a baking pan with cooking oil generously. Pour the batter and spread it evenly. Stud in some walnuts or choco chips if you wish. Pre heat an oven in convection mode at 180c.Bake the bread for 30 minutes. Actual recipe called for 40 minutes baking time. But mine took just 30 minutes. So keep an eye after 25 minutes. Insert a toothpick or back of a spoon to check the cake. If it comes out clean, its done else bake for another 5 minutes. Remove the bread from the oven and let it cool down for 5-10 minutes. Loosen the sides of the bread using a sharp knife and invert the baking pan over a plate.Bread will come out easily. Make slices and serve it warm.Enjoy ! You can replace maida with wheat flour and sugar with brown sugar or honey. Cinnamon powder gives an awesome aroma to this bread.Do not skip it. Adding vanilla essence is optional. Hey Chitra! first of all I would like to thank you for such delicious recipes. I tried the banana cake but it turned out to be sour :( I don't know why. Banana were ripe and sweet plus yogurt was fresh too. do you have any idea why it happened please reply. I am really not sure how it turned out sour even after adding fresh curd. I doubt on the quantity of baking soda. May be try to use half of it. You will get it right :) Thanks ! Hi chitra yesterday I tried this recipe .came out well and tasted yummy.just perfect.I baked it in a cake pan.what is the size of the pan u used here.can I mail u regarding any queries? Yes, you can use. But baking time may vary slightly. Keep an eye and check 5 minutes before the mentioned time. I tried this recipe and it came out perfect. But the upper layer was not moist like yours.what would have been the reason? Thanks for trying. Please reduce the baking time or consistency of the batter also matters. Make it slightly thin next time.